Is the transit service important to you? Would you like to share your opinion on the matter? Then join the STO rider panel now! As a panel member, you will get e-mail invitations to complete online surveys about various topics related to regular public transit, and you may even get a chance to be the first to test new products and services. Your answers will help us to determine our riders' level of satisfaction and needs, in order to improve customer service. Over the past few months, panel members completed three customer satisfaction surveys. Occasionally, we will share some survey highlights with you. Only 47% of riders with children aged 6 to 11 years are aware of the Family fare. Each time you complete a survey, you will be entered into a draw to win participation prizes! Congratulations to Bridget who won two entries to Nordik Spa-Nature, Thérèse who won a $100 gift card at Les Promenades de l'Outaouais, and Arash, who won a $300-prize for the Hot Air Balloon Festival! 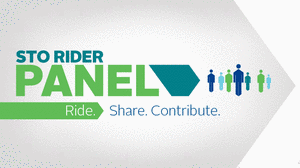 Would you like to be part of our rider panel? Sign up on our dedicated platform! By filling out the registration form, you agree to receive up to one e-mail per month inviting you to answer online surveys. Your participation to each survey is entirely voluntary, and you can unsubscribe at any time by clicking on “Remove me” in your account or by sending us an e-mail. Your answers will only be used for statistical purposes. For more details, please refer to our terms and conditions. If you are under 16 years old, or employed by the STO or a marketing research company, you are not eligible to participate. If you have any questions, please contact us by e-mail at enquetes@sto.ca. Sign in or create your profile to receive our newsletter, alerts and enjoy many other advantages!